Lithograph by H. R. Robinson. Just as my chronology gets into print, it needs updating. And it’s an important date change, too. It’s always said that Muybridge first went to America in 1851 or ‘52. In the 1960s-70s his biographer Gordon Hendricks tried to find him on ships’ lists for 1852, but without success. This morning, I found him. It’s so much easier now of course, having access to digital records. I have searched before without luck, but I searched yet again, and there he was. Edwd. Muggeridge, age 20, Merchant. He left Liverpool on the eponymous steam ship Liverpool in the summer of 1850, arriving in New York on or shortly before 16th July. 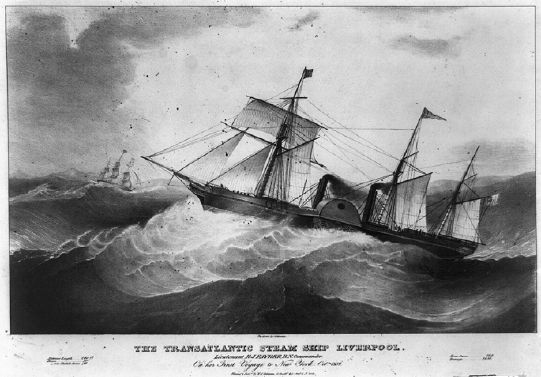 The steam ship Liverpool had made its first transatlantic voyage from England to the United States in October 1838. 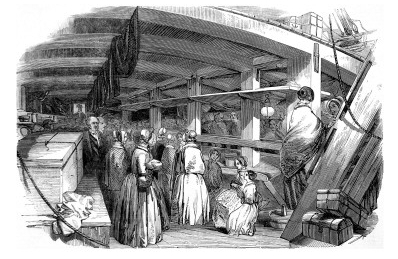 In July 1850, while Muybridge was mid-Atlantic, the Illustrated London News published engravings showing what such a trip entailed. Muybridge would most likely have travelled steerage class, with all of its discomforts. 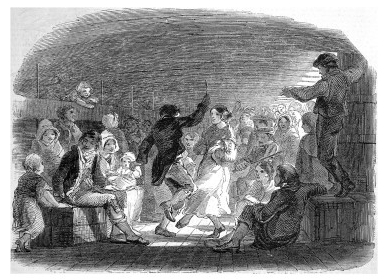 But perhaps he enjoyed some fun, too, and joined in the dancing (see below). 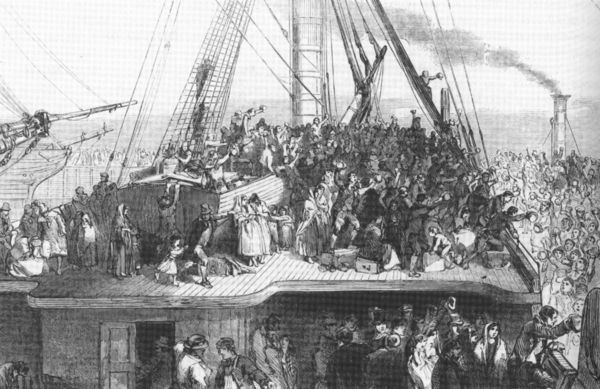 Four hundred and seventeen passengers left Liverpool, 414 arrived in New York, three having died during the voyage. Master of the Liverpool was John Eldridge, who had been at sea since the age of twelve, and was responsible for registering the passengers’ names on arrival. So it seems that Muybridge never did see the Great Exhibition of 1851, being already established in New York by that time. This entry was posted in 19th-century photography, biography, news and tagged 19th-century photography, Muybridge, news, photography. ← New book from Taschen!